Opportunities for hiking, biking, canoeing or kayaking excursions abound, with rental options if you don’t yet have your own gear. Check out the Shoreline Cycling Club and their publication, DIRTroad for thorough descriptions and maps of the area’s cycling routes. Ludington is considered one of the best ports on Lake Michigan for salmon and trout, and fishing is a year-round sport on our lakes and rivers, on your own or through a charter. Ludington is also the location of the famous Offshore Classic Fishing Tournament in July. Boaters will find several options for public boat launches and excellent marinas in Ludington with accommodations for vessels up to 125 feet in length. 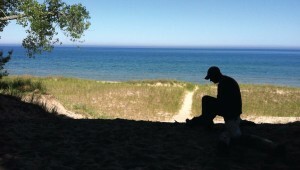 Stearns Park Beach on Lake Michigan in Ludington has many amenities and is perfect for families. Another favorite Lake Michigan beach site is ‘First Curve’, with over three miles of shoreline on M116 on the way to Ludington State Park. Golfers will find rolling hills at Lincoln Hills and Hemlock and tight fairways at Lakeside Links. There are another seven courses within an hours drive of Ludington. And don’t forget to visit our farms and orchards. If your pooch enjoys outdoor recreation too, they’ll be welcome at Buttersville Beach south of Pere Marquette Lake and the sandy shoreline south of the North Breakwater Pier at Stearns Park Beach. The fenced, one-acre Central Bark, Ludington’s dog park, is also a good option for dogs of all sizes to expend some energy. Our vast Lake Michigan shoreline hosts water and nature lovers of all generations. So too does the popular Ludington State Park, situated between Lake Michigan and Hamlin Lake. It is home to over 5,000 acres of scenic sand dunes, ponds, marshlands and forest. There are campgrounds, many miles of hiking trails, and in designated areas biking and wheeled traffic are permitted. It’s a water sports paradise with canoeing, kayaking, boating and swimming also available. The stately Big Sable Point Lighthouse is located on Lake Michigan within the Park. The Manistee National Forest offers year-round recreation including hunting, fishing, off-road vehicle use, biking, camping, snowmobiling, river use and berry picking and mushrooming. Be sure to look for Trillium, the delicate wildflower, in spring. Manistee is the name of a Chippewa Indian God and means “Spirit of the Woods.” Explore Nordhouse Dunes and the Lake Michigan Recreation Area north of Ludington just outside the county line on W. Forest Trail Road for additional Lake Michigan shoreline. People who say there is nothing to do outside, simply aren’t looking. This area is packed with some amazing outdoor activities and my personal favorite is the Ludington State Park. The area is a 365 day State Park with so much to do and see. Watersports, peaceful nature walks, relaxing trips to the beach or socializing with friends on the cross country ski trails are all available in their respective seasons. Hiking the shore ice is also a unique thing to do in the dead of winter when you just need to stretch your legs. If winter invigorates you and makes you feel like a kid again, you have lots of company here. 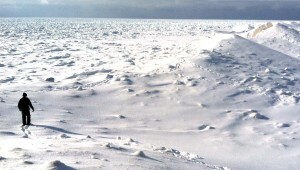 Hike or fat bike along the Lake Michigan shoreline, and be sure to bring your camera for photos that look like a scene from an Antarctic research documentary. Fish for trout and steelhead in our pristine rivers and hunt in the Manistee National Forest. Enjoy over 10 miles of well-marked and easy to navigate cross country ski and snow shoe trails at Ludington State Park. In the Manistee National Forest you can snowmobile or cross-country ski or snowshoe, and it’s an especially magical experience when there’s a full moon. Our festivals continue in winter too. Celebrate New Year’s Eve with a few thousand of your neighbors at this free winter street party with beer, DJ, ball drop and fireworks. Barely a month later it will be time to enjoy the Pure Ludington BrrrewFest, and then there’s the St. Patrick’s Day Parade in March. 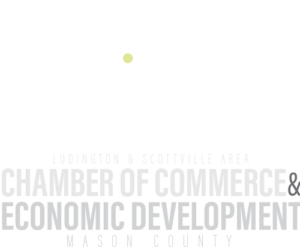 A full slate of cultural and educational activities abound as well at Ludington Area Center for the Arts, West Shore Community College and the Mason County Public Library. Visit our partners at: www.PureLudington.com for a complete list of leisure and recreation activities during all of our four seasons.